To me, nothing beats the tasty caramelized flavors of roasted veggies but the thought of turning on my oven right now is less appealing than vacationing in the Sahara. Thankfully, I can have a similar experience without the hot oven thanks to these recipes from I Can’t Believe It’s Not Butter!®. The addition of just a couple of ingredients turns these two veggie side dishes into stars of the show! Simply pair with whatever protein you’re grilling up tonight. Well, hello, hello! It is still gloriously steamy outside (don’t forget, winter is just around the corner! ), so to help beat the heat I have another set of grill packet recipes to offer this week! To me, nothing beats the tasty caramelized flavors of roasted veggies but the thought of turning on my oven right now is less appealing than vacationing in the Sahara. Thankfully, I can have a similar experience without the hot oven thanks to these recipes from I Can’t Believe It’s Not Butter!®. The addition of just a couple of ingredients turns these two veggie side dishes into stars of the show! Simply pair with whatever protein you’re grilling up tonight. 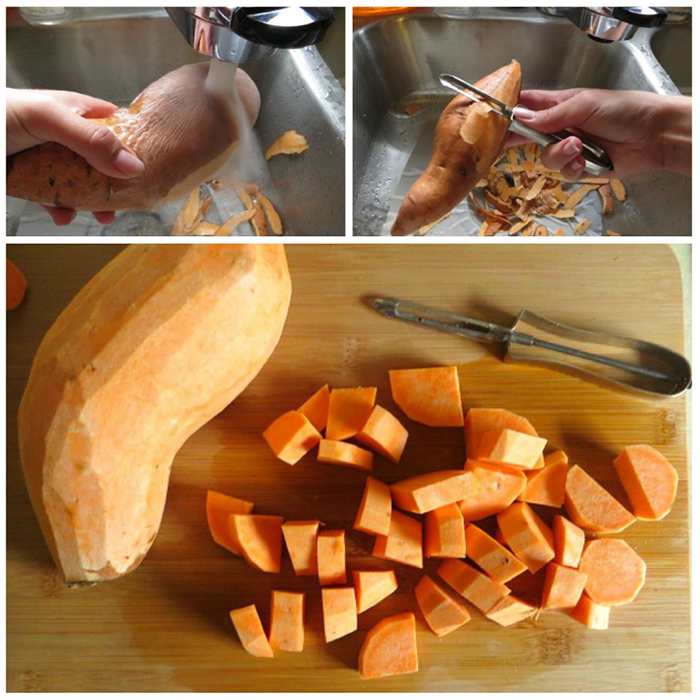 First, wash and peel a pound and a half of sweet potatoes. Then cube into uniform pieces so they cook nice and evenly. Next, add your potato bites to a large bowl. To the potatoes, add the I Can’t Believe It’s Not Butter!® Light Spread (adds flavor to the potatoes with 50% fewer calories and grams of fat than butter), lime juice, honey, garlic cloves, and chipotle pepper. This mixture results in a sweet, buttery flavor with just a hint of kick from the chipotle pepper. Ah, can’t be beat! The smell of fresh garlic has the effect of slowing things down for me, reminding me to enjoy the small things in life. 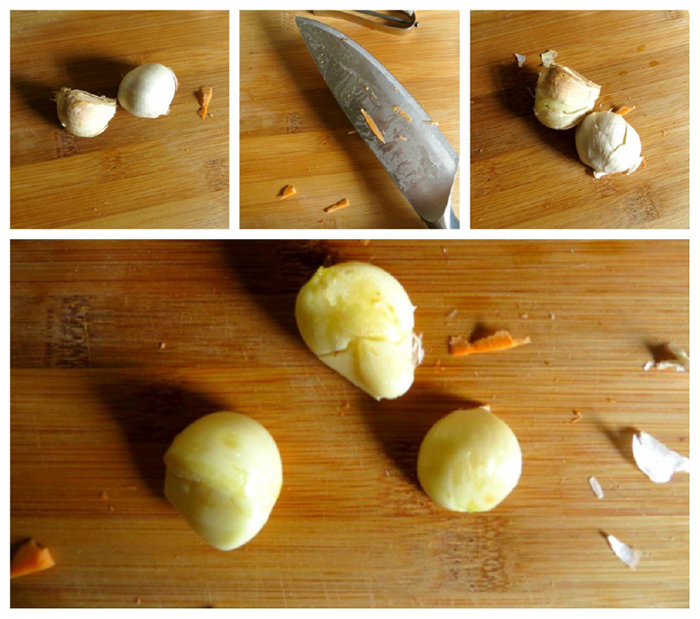 I really do love peeling my own garlic cloves and it’s so simple. If you haven’t tried it before, it’s well worth the extra effort! 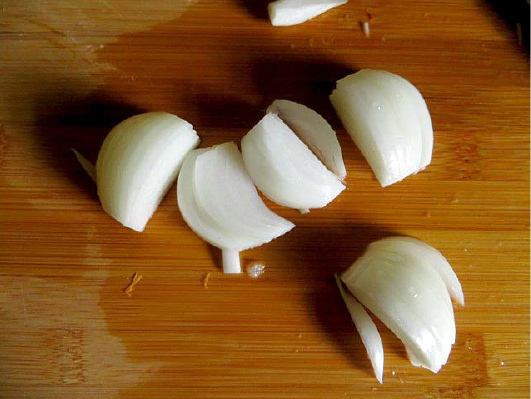 How to peel garlic: Simply place your desired number of cloves on a cutting board, and with the broad side of a large knife, carefully apply pressure. This will break the clove, allowing you to easily remove the papery skins. Voilá! 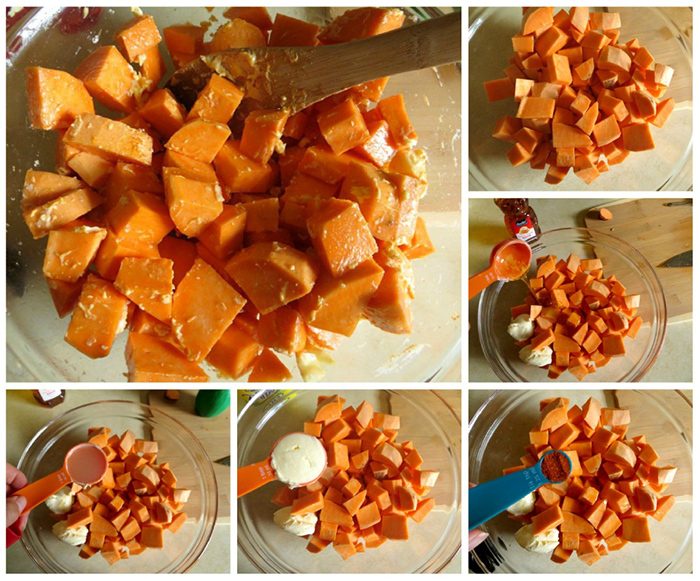 Back to our sweet potatoes; spoon the mixture into a large piece of heavy-duty aluminum foil. 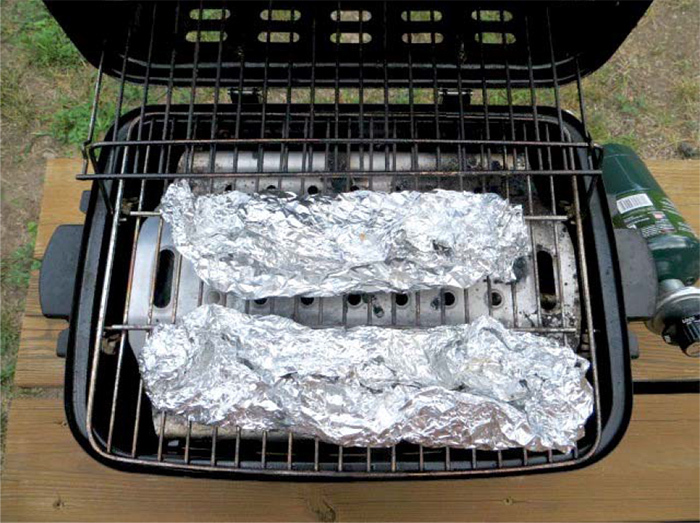 Wrap the foil loosely around the sweet potato mixture (just like we did last week the with Easy Fajita Grill packets). Then place that foil package onto another large piece of foil, folding in the opposite direction. Bring it on out to the grill and start cooking over medium high heat. Now for the Green Beans! Green Beans can be sort of ho-hum, so I was ecstatic to see this slightly sweet variation. Trim up a pound of green beans (great task for little hands helping in the kitchen) by snapping off the very ends of washed green beans. Add to a medium-sized mixing bowl. Next, slice up a small onion into wedges. 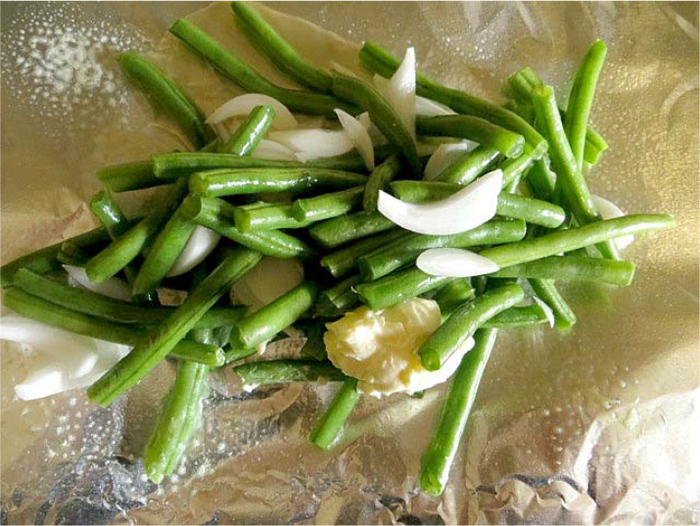 Add the onion wedges, apple cider vinegar, honey, and I Can’t Believe It’s Not Butter!® Light Spread to your bowl of green beans. Toss together and spoon into the center of a large sheet of tin foil. Seal the packet similar to the sweet potatoes. By this time, the first ten minutes of cooking time should have passed for the sweet potatoes. 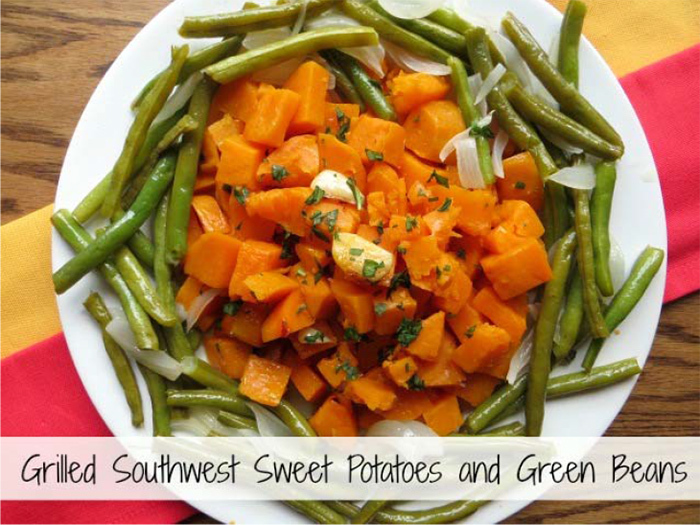 Add the green beans to the grill and give the sweet potatoes a good shake. Let finish cooking for an additional ten minutes until the potatoes and green beans are tender and serve! What’s your favorite grilled protein to serve with green beans and potatoes? Combine all ingredients except 1 tablespoon I Can’t Believe It’s Not Butter!® Light Spread in center of 30 x 18-inch sheet heavy-duty aluminum foil. Wrap foil loosely around mixture, sealing edges airtight with double fold. Place on another 30 x 18-inch sheet of foil; seal edges airtight with double fold in opposite direction. Grill, shaking package occasionally and turning package once, 10 minutes or until green beans are tender. Top with remaining 1 tablespoon Spread. 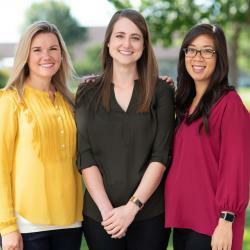 Nutrition Information per serving*: Calories 90, Calories From Fat 25, Saturated Fat 0.5g, Trans Fat 0g, Total Fat 2.5g, Cholesterol 0mg, Sodium 50mg, Total Carbohydrate 15g, Sugars 6g, Dietary Fiber 4g, Protein 3g, Vitamin A 70%, Vitamin C 35%, Calcium 4%, Iron 8% *Nutritional values are based on data from the USDA National Nutrient Database for Standard Reference. Actual nutritional values may vary due to preparation techniques, variations related to suppliers, regional and seasonal differences, or rounding.